3:04 1st | Michigan heads on the power play as U-W's McGuire gets called for hooking! Badgers also kill off the McGuire minor! 1:09 left in the frame and we are tied 2-2. 2:09 1st | Badgers capitalize on a turnover in the neutral zone to even the score at two apiece. 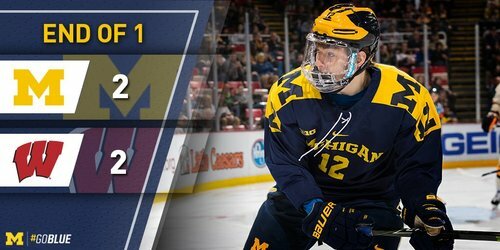 END 1: Wisconsin and Michigan are tied 2-2. 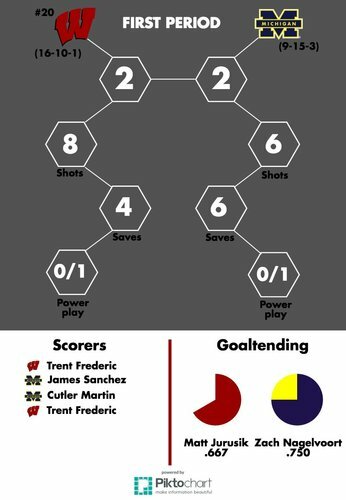 Two from Frederic for UW around goals by Sanchez and Martin for the Wolverines. SOG 8-6 for UW. It was an exciting opening period of hockey on both ends of the ice as we head into intermission tied at two apiece. Each team had four shots on goal from the high-scoring 'home plate' area in the first. Trent Frederic has three two-goal games in his last six outings. @NHLBruins first-round pick is up to 14 goals this season. Badgers and Wolverines back out for the second period tied at 2-2. Badgers lead shots on goal 8-6. #Badgers have 5 short-handed goals this season, and Frederic has been involved in all of them. 2 goals, 3 assists. SWIM UPDATE: at the conclusion of the Big Ten Championships, @BadgerSwimDive women finish third as a team. Badgers and Wolverines are tied 2-2 as the second period begins. Well it has been a less eventful start to this period. A minute in and no goals. 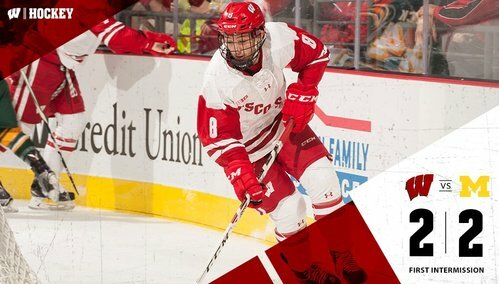 BADGERS GOAL: Aidan Cavallini scores his first goal at the Kohl Center to give UW a 3-2 lead. Rebound of a Hughes chance in front. 17:59 2nd | Wisconsin sneaks the rebound in to regain lead, 3-2. JD Greenway is called for tripping and UW will be a man down for the second time tonight. 15:54 left in the second period. Greenway to the box for tripping, and probably deserved another for holding, putting Michigan on the PP. 15:54 2nd | Wolverines go back on the PP! U-W's Greenway gets called for tripping. Nagelvoort stops Kunin behind the defense on a pass from Frederic. Kill! Greenway out of the box and teams are back to full strength. Badgers lead 3-2 with six minutes gone by in the period. Kunin and Martin get matching minors for a scuffle after the whistle. UW leads Michigan 3-2 with 13:18 left in the second.